These five Mancunians first came together as a musical group during 1961 supplementing their bookings, in common with many others of the period, with stints in Hamburg playing rock and roll. They also found work during the summer season at various British seaside resorts and, possibly because of this, became much more than just a singing group. The inclusion of comedy in their stage act had become important before they were known nationally through their recordings. They struck lucky with their first release, 'If You Gotta Make A Fool Of Somebody'; the original James Ray version of which aroused no interest in the UK. This hit gave them a good start and the outrageous stage antics of Garrity soon became familiar to British TV viewers. Their second release, 'I'm Telling You Now' consolidated their credentials as big hitters. Garrity's zany comedy also turned out to have appeal in America and his exposure on TV there resulted in further US chart entries. The Americans found a name for Freddie's high stepping dance routine- 'The Freddy' which was turned into a US hit, and even covered by 'twister' Chubby Checker. However, it was never issued at home, and by the end of that year- 1965, the Dreamers' UK chart career was over. The EP shown on the right was issued in 1964 while Freddie and his team were very much at their peak. The record contained songs from their participation in the Alan Klein movie "What A Crazy World". 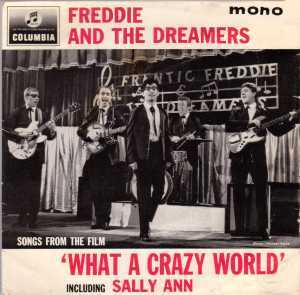 The group were called 'Frantic Freddie & The Dreamers" in the film. According to Michael Carreras' sleeve notes: "Freddie is the only man I know who can sing, dance and remove his trousers all at the same time"- which records pretty well their stage act. Despite their lack of continued success on record their 'over-the-top' stage act maintained sufficient appeal to keep them in plenty of live bookings until the end of the 1960s. Garrity has since resurfaced with new 'Dreamers' and could still be seen throughout the 1990s, despite the passage of many years, prancing and dancing in a manner likely to 'do himself a mischief' as they say in Manchester. However, following a heart attack during 2000, the otherwise irrepressible Freddie was forced into unscheduled retirement. Sadly, Freddie died on May 19th 2006, and perhaps some of the fun that made the 1960s so wonderful died too. Columbia SEG8302 1964 "You Were Made For Me"
Columbia SEG8349 1964 "Freddie Sings Just For You"
Columbia SEG8403 1965 "Ready, Freddie, Go!" Columbia SEG8457 1965 "Freddie And The Dreamers"